Take a taxi or bus from Trang Airport to Trang Bus Terminal and from there a minivan to Koh Lanta which makes the sea crossing via the shortest route on a car ferry taking. The total travel time will be around 4 to 5 hours depending on when the next minivan to Koh Lanta departs. Take a direct service which starts with a minivan journey of about 1 hour from Trang Airport to the ferry pier, and then a longer sea crossing either on a speedboat or fast ferry to Koh Lanta. The total travel time is 3 hours. There is currently a single direct service from Trang Airport to Koh Lanta which you can book online. The arrival times can vary on this service dependent on the conditions at sea, and how many drop offs and pick ups the speedboat or ferry makes on route. Sometimes the service is early and other times it can be late. You can also book taxi and private minivan services from Trang Airport to Koh Lanta which may in fact work out cheaper if you travelling in a group. A representative with a Tigerline Travel sign will be by the exit door of the arrival terminal of Trang Airport 30 minutes before the departure time. The first part of the journey to Koh Lanta with Tigerline Travel is a 47.5 km journey from Trang Airport to Haad Yao Pier. The Tigerline Travel speedboat or fast ferry service arrives in Koh Lanta at Saladan Pier. Saladan Pier is in Ban Saladan, which is the main town at the top end of Koh Lanta Yai. There are plenty of taxis and tuk-tuks which wait at Saladan Pier to take passengers to onward destinations in Koh Lanta. 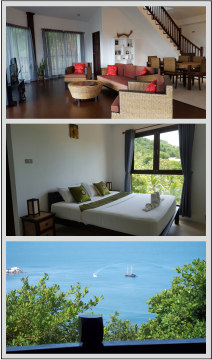 Alternatively, you could choose to stay in Ban Saladan itself which has many nice guesthouses and small hotels over looking the harbour and river estuary or sea.